What an afternoon. First, Pat Field for Payless shoes on sale (see tomorrow's post), then a little Manhattan Mall wandering inspired by a Racked Twitter request, and last, a perfect, just-a-step-above fast food burger & curly fries at Bruce's Burger. All I needed for more perfection was a McDonald's shake. I dropped by Afaze in Manhattan Mall as earlier in the day Racked twittered the need for those plastic backs for earrings. Which reminded me of my dire need for these as I seem to always lose one in every pair of earrings I own (blame cats...). Where to find? Mirthful33 was lovely enough to twitter back: Claire's or Afaze in Manhattan Mall. Really one of my most productive twittering sessions yet. You could wear that headband across your forehead ala Arden Wohl, but then I may have to send Cousin Phil over to torture you. 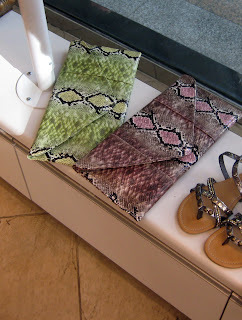 Bright pink and green faux-skin clutches, $22, what's not to love? 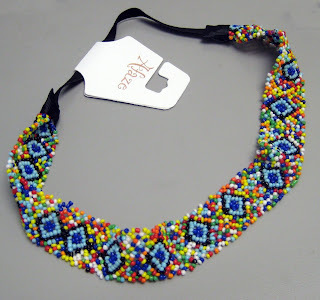 Afaze is like a grown-up Claire's. One can get a little lost in there. And I'm very excited with the Manhattan Mall progress. No JCPenney yet, but everything's looking all shiny and modern. Afaze, Manhattan Mall level 1, 33rd & 6th Ave.
Bruce's Burger, 1 Penn Plaza in Kmart corridor, 34th & 7th. Or, right around the corner from the awesome Garrett Popcorn. Those faux python clutches are perfect! Love those clutches and the sandles beside them are pretty cute too. Hi there-I adore the first bangle, such gorgeous colours! Shoes, fries, and accessories: The big three of AWESOMENESS. Funny we both wrote about the mall and JCP this week! Any inside scoop on it? An opening date? Any other retailer in the works for the mall? Does Cousin Phil do contract work?? Sister Wolf - I'll have to see if he's retired from the Marines yet. Seeker - will visit today! and you know who i'm voting for! Natanya - have to check your post out, am just back in town. Most of the stores are set in the mall, but Square One will be back on the second floor, Hallmark is coming in on the second floor, and pretty much the rest is as is. KB Toys, of course, is out. I should get an opening date closer to the summer and will def. keep you updated.